From the evening of 2 October 2018, 24 hours of absolute tension prevailed in the MASCOT Control Centre at the DLR site in Cologne: Approximately 40 scientists followed the events taking place 300 million kilometres from Earth – even before the applause-filled separation of the German-French landing module on 3 October 2018 at 03:58 CEST [please check!] from the Japanese space probe Hayabusa2, the landing on the asteroid Ryugu six minutes later, and the end of the mission at 21.04 hours CEST. MASCOT fulfilled and exceeded the expectations of the lander, as the batteries delivered more power than planned. Lasting 17 hours, this made it possible to conduct experiments for one additional hour. All four instruments on-board MASCOT did far more than the planned measurements and recordings. In the foreground of the image, we can see MASCOT Project Manager Tra-Mi Ho from the DLR Institute of Space Systems in Bremen at the MASCOT Control Centre of the DLR Microgravity User Support Centre in Cologne, relieved by the almost smooth running of this extraordinary mission. In the background, Ralf Jaumann, Scientific Director of MASCOT, presents some of the 120 images taken with the DLR camera MASCAM of the DLR Institute of Planetary Research in Berlin. DLR’s MASCAM camera took 20 images during MASCOT’s 20-minute fall to Ryugu, following its separation from Hayabusa2, which took place at 51 metres above the asteroid’s surface. This image shows the landscape near the first touchdown location on Ryugu from a height of about 25 to 10 metres. Light reflections on the frame structure or the camera body scatter into the field of vision of the MASCAM (bottom right) as a result of the backlit light of the Sun shining on Ryugu. Ryugu has a coarse textured, extremely dark surface that reflects only about 2.5 percent of the incoming sunlight. The rugged area shown here is about as dark as asphalt. Details of the terrain structures are visible in the MASCAM images thanks to the photosensitive semiconductor elements of the 1000 by 1000 pixel CMOS (complementary metal-oxide semiconductor) camera sensor, whose dynamics enhance even the weakest light signals and deliver scientifically usable image data. 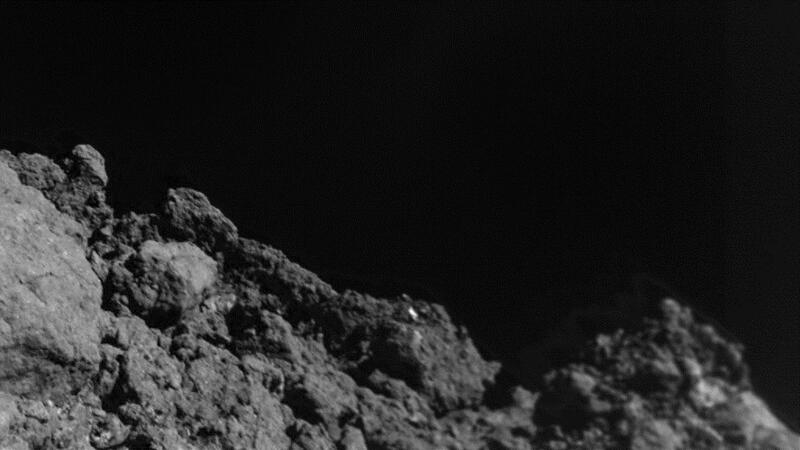 The approximately 20 images acquired with the MASCAM camera on the MASCOT lander during the descent show an extremely rugged surface covered with numerous angular rocks. 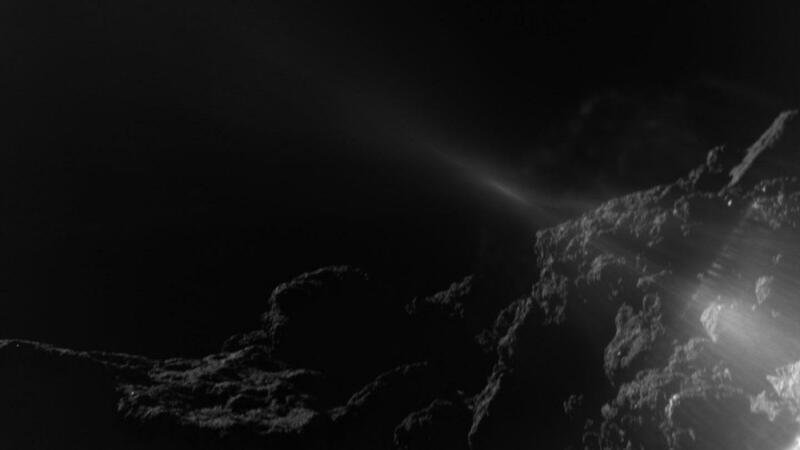 Ryugu, a four-and-a-half billion year-old C-type asteroid has shown the scientists something they had not expected, even though more than a dozen asteroids have been explored up close by space probes. On this close-up, there are no areas covered with dust – the regolith that results from the fragmentation of rocks due to exposure to micrometeorite impacts and high-energy cosmic particles over billions of years. The image from the turbulent rotating MASCOT lander was taken at a height of about 10 to 20 metres. New images from MASCOT's landing on asteroid Ryugu were presented by DLR, JAXA and CNES today at the International Astronautical Congress (IAC). It was a day full of exciting moments and a happy team of scientists and engineers: late in the afternoon of 3 October 2018, the German-French lander MASCOT completed its historic exploration of the surface of the asteroid Ryugu at 21:04 CEST, as its battery ran out. On-asteroid operations were originally scheduled to last 16 hours after separation from the Japanese mothercraft Hayabusa2. But in the end, the battery lasted more than 17 hours. Upon landing in the early morning and subsequently relocating using the built-in swing arm, all instruments collected detailed data on the composition and nature of the asteroid. The on-board camera provided pictures of the landing, hopping manoeuvres and various locations on the surface. For MASCOT, the Sun set three times on Ryugu. The lander was commanded and controlled from the MASCOT Control Centre at the German Aerospace Center (Deutsches Zentrum für Luft- und Raumfahrt; DLR) in Cologne, in the presence of teams of scientists from Japan, France and Germany. All scientific data was transferred to the mother probe according to plan. 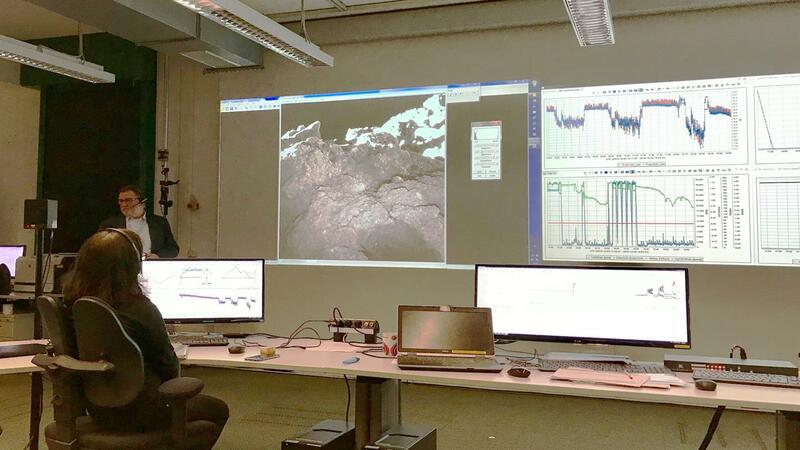 "With MASCOT, it has been possible to, for the first time, explore the surface of an asteroid directly on site so extensively," says Hansjörg Dittus, DLR Executive Board Member for Space Research and Technology. "A mission like this can only be done working in close cooperation with international partners – bringing together all their expertise and commitment." With MASCOT, DLR has been working closely with the Japanese space agency JAXA and the French space agency CNES. Hayabusa2 acquires images of MASCOT on its approach to Ryugu. Three consecutive images acquired on 3 October 2018 between 03:57:54 and 03:58:14 CEST with the wide-angle optical navigation camera (ONC-W2). MASCOT can be seen at the top. MASCOT landed safely on Ryugu in the early morning of 3 October 2018. "After a first automated reorientation hop, it ended up in an unfavourable position. With another manually commanded hopping manoeuvre, we were able to place MASCOT in another favourable position thanks to the very precisely controlled swing arm," says MASCOT operations manager Christian Krause from DLR. From that position, MASCOT completed a complete measurement sequence with all instruments over one asteroid day and an asteroid night. "Later, we were able to continue the activities on Ryugu with a special manoeuvre," adds Ralf Jaumann, DLR planetary scientist and scientific director of MASCOT. "With a 'mini-move' we recorded image sequences that will be used to generate stereo images of the surface once they have been analysed." During the first manoeuvres, MASCOT moved several metres to the next measuring point. Finally, and seeing that the lander still had battery power left, the researchers dared to make a bigger jump. All in all, MASCOT explored Ryugu for three asteroid days and two asteroid nights. A day-night cycle on Ryugu lasts about 7 hours and 36 minutes. At 21:04 CEST, communications with Hayabusa2 were interrupted, because of the radio shadow entering with each asteroid rotation. Hayabusa2 is now returning to its home position, at an altitude of 20 kilometres above the asteroid’s surface. In addition to the images acquired by the DLR camera MASCAM, a DLR radiometer, a magnetometer from TU Braunschweig and a spectrometer from the Institut d'Astrophysique Spatiale provided a variety of measurements on the temperature, magnetic properties and the composition of the near-Earth asteroid Ryugu. MASCOT is now a silent inhabitant of Ryugu. "The evaluation of the valuable data has just begun," says MASCOT project manager Tra-Mi Ho from the DLR Institute of Space Systems. "We will learn a lot about the past of the Solar System and the importance of near-Earth asteroids like Ryugu. Today, I look forward to the scientific publications that will result from MASCOT and the remarkable Hayabusa2 mission of our Japanese partners. "Hayabusa2 played a crucial role in the success of MASCOT. The Japanese probe brought the lander to the asteroid. Thanks to precise planning and control, the communication links to the lander could be optimally used for data transmission, so that the first pictures were received on the very day of landing. The remaining scientific data, which was transmitted to Hayabusa2, will be sent to Earth in the coming days.